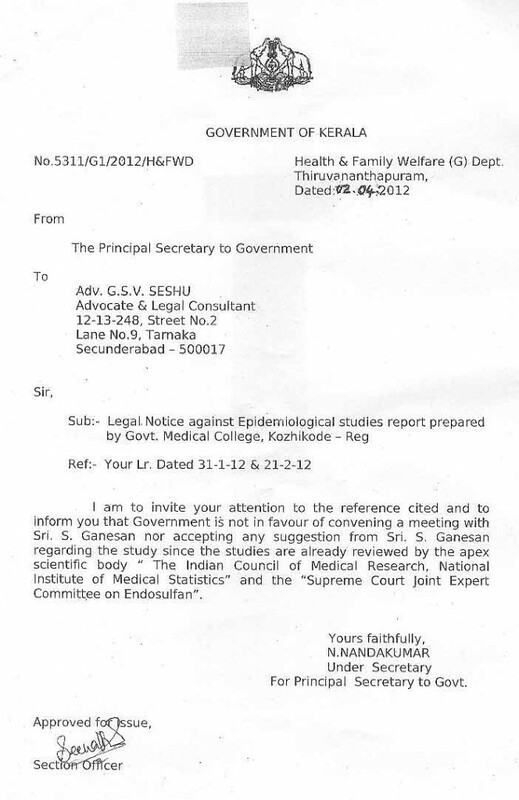 Whether there is any substance in the controversy over the letter written by Principal Secretary (Health) to the Community Medicine Department of Kozhikode Medical College asking, essentially, whether they are willing to make any amends to the report of their studies on endosulfan is not easy to determine. 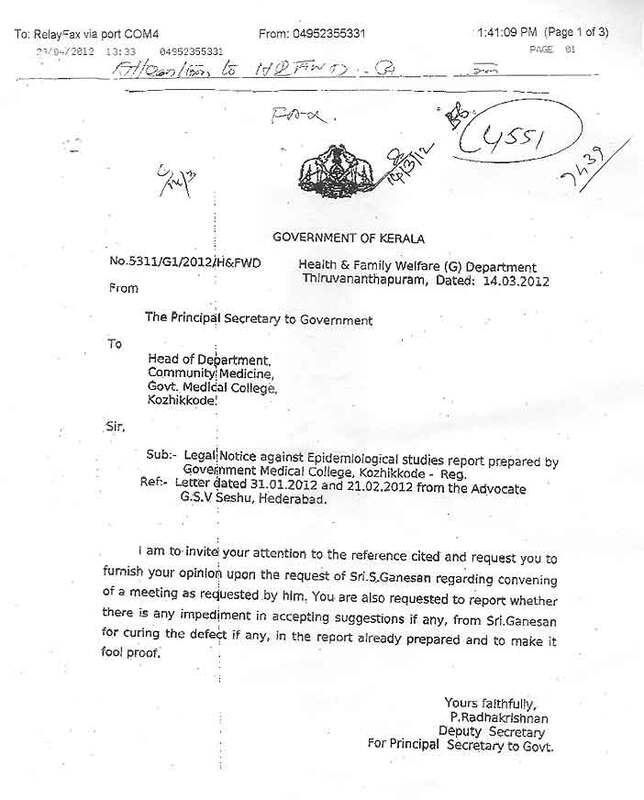 Chief Minister Oommen Chandy has denied any wrong-doing by officials of the Health Department in their response to legal notice on endosulfan and that no minister had seen the file or the correspondence. Even if a Minister has given a directive, the Health Secretary has seen to it that the letter is carefully worded after obtaining the advice of the Law Department. The letter written by the Health Secretary is reproduced below. 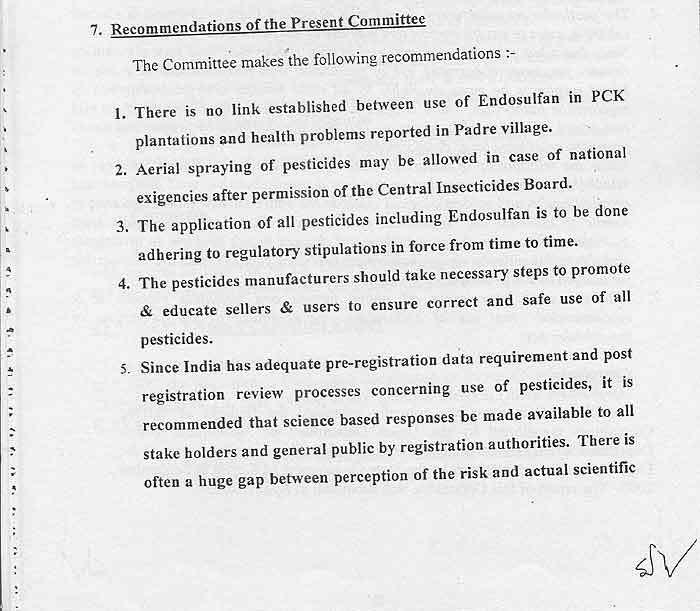 The wordings like the use of ‘impediment’ may suggest a bias in favour of endosulfan manufacturers. However, the net result of final decision communicated to Mr. Ganesan strengthens the legal case in favour of ban on endosulfan. From the letter (reproduced below) read with earlier communication to the Department, it would appear that the government is upholding the results of the studies after due process and had shown no bias towards the Department. It could be that the Principal Secretary Rajiv Sadanandan acted intelligently. The only problem with the letter is that the date appears to have been over-written. Was it sent before the controversy broke out or after that? Such doubts arise because the history of the UDF government headed by Oommen Chandy was not one of unblemished support to the victims of endosulfan. 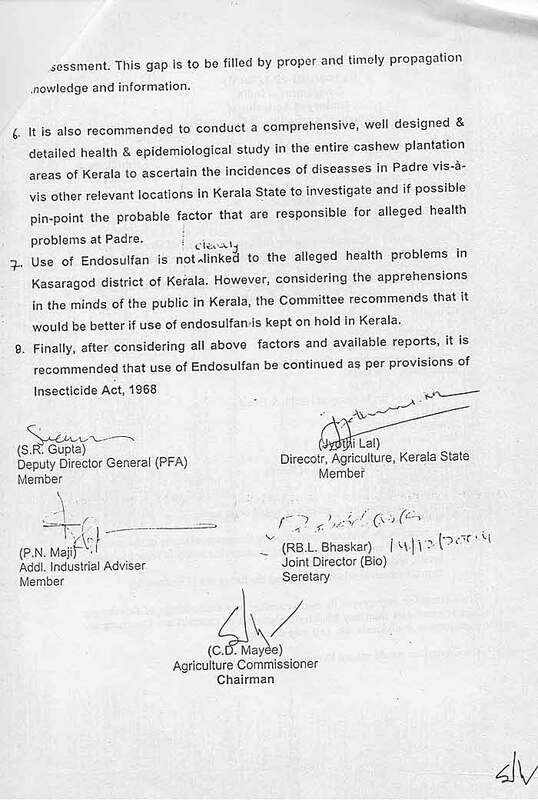 As pointed out in an earlier post, the Agriculture Secretary of the Government had signed the report of the Mayee Committee (conclusions are reproduced below) hardly a fortnight before Mr. Chandy set out to tour the affected villages of Kasaragod district promise solace to the victims in 1984. This entry was posted in Administration, health, Kerala and tagged endosulfan, health effects, Oommen Chandy by Roy Mathew. Bookmark the permalink.